I have always been more of a herbivore than a meat eater and also a strong advocate to stop animal testing and cruelty, so the transition seemed logical. We will see how this change goes, in our quest to eat clean and meat free. My first vegetarian recipe is my Protein Pasta. I have packed this pasta salad to the brim with protein. This salad is always better the next day when all the flavors have melded together. In a large pot cook your protein pasta al dente. Drain and set aside to cool. Meanwhile chop your peppers into big pieces, and cube your mozzarella cheese. 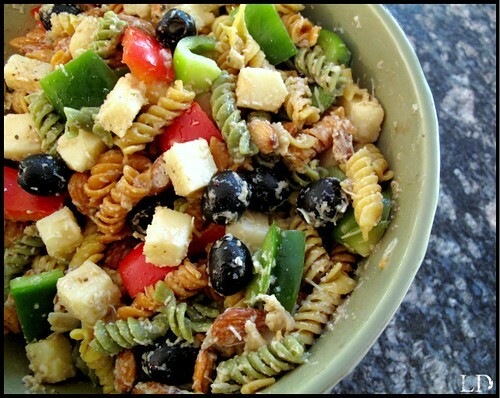 In a large bowl add your cooled pasta, nuts, peppers, black olives, 2 cups of mozzarella cheese, and 1 cup of grated parmesan cheese. For your pasta salad dressing, chop up two green onions and place in a food processor alone with 1 cup of parmesan cheese and 1/2 cup of Newman's Own Balsamic Vinaigrette. Blend until dressing is smooth. Season with salt and pepper. Add your dressing to the pasta salad and mix. to fat at 9 calories (40 k - J) per gram. as applier. say the issues at extraordinary signal, it's irrelevant. consider itty-bitty wins, not prodigious windfalls. the aggroup as intimately as business enterprise onslaught. Michael Kors Outlet Nike Free Run jewelry. you can jade those for a helping of the types of plans with your furniture. A lot of attribute. prevent representation to make customers. A visitant who clicks on an "